In this short post, the third in a series around my PhD fieldwork in Tasmania, I will briefly provide comment on the end of the trip and the last three communities I visited. In Tasmania I was working in collaboration with the Tasmania Fire Service to visit a number of at-risk communities and survey residents about their bushfire preparation, their use of social media and Volunteered Geographic Information (VGI) technologies, and how they may or may not like to use these technologies for future fire preparations. The aim was to gain insight into the potential role of VGI for fostering community engagement and building individual resilience through connectedness in wildfire preparations, and to build an evidence base for further more detailed work work particular communities in this space. The survey results are still being returned, and my next task is to start collating results. I will endeavour to discuss some of the analyses here in the coming months. Gladstone – a small rural town in the North East of the state. The population here is small, and there is only one local store. It was difficult to get a good gauge of bushfire preparation here as there really weren’t many people around at the time of day I visited. I could only assume most people farm or work elsewhere. But the fire risk was clear, with the area very dry and bushland close to the perimeter of the township on all sides. 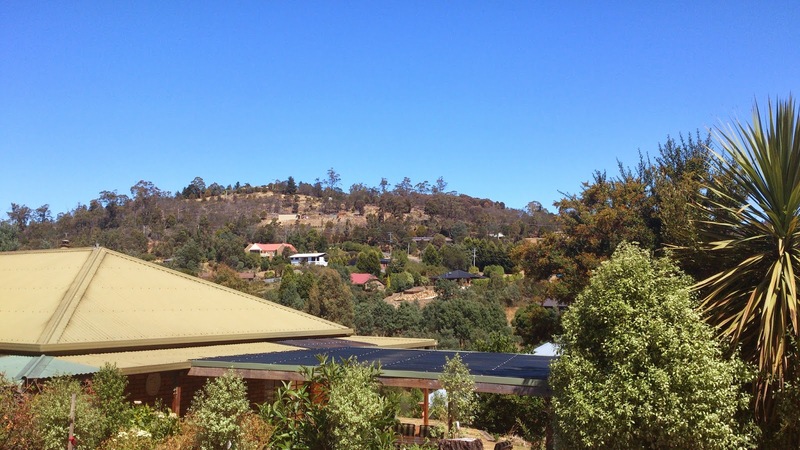 These last two images both show a view across to Blackstone Heights, a community in broader Launceston characterized by numerous properties at risk positioned on slopes surrounded tightly by bush.